This inspirational bundle holds all 20 RP products and after registration you also can request the amazing Prisma! RAW-Kick: Edgy Kicks for comtemporary music. RP-Verb 2: Most intriguing in RP-VERB 2 – alongside the to a great sound – is the new 'Reverser' section! Blade: The cutting edge of today's synthesizers! Punch-BD: Based around the BD module of the multi award winning Punch virtual drum synth. RAW: Cutting edge EDM synthesizer with the focus on 'distorted sounds'. SubBoomBass: Ultra-deep groove bass synth with built-in step sequencer. Predator: Phat analogue style synth with killer presets and first class features. Prisma: Get creative using Rob Papen's take on instrument layering. Vecto: 4 Oscillator Vector Synth. 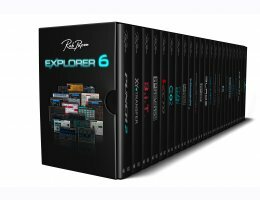 RP-Reverse: A cool plugin to be used on your drum-loops, vocals or instruments.